West Virginia State Parks is including something extra during the 2017 holiday season on gift card purchases of $100 or more. The perfect gift is one that keeps on giving, and state parks in West Virginia are including something extra this holiday season on gift-card purchases of $100 or more, according to a parks spokesperson. Through Dec. 18, 2017, the state parks system is offering “Something Extra” coupons for every $100 gift card purchased. The bonus includes eight coupons that can be used at select state parks and forests in 2018. Gift cards may be purchased online at www.wvstateparks.com or by calling 304-558-2764. There are no shipping or handling fees. Gift cards and “Something Extra” coupons are mailed together through the U.S. Postal Service. “Our ‘Somethings Extra’ coupons are great value and encourage visitors to get out and discover the fun and affordable activities our state parks and forests offer,” said Carol Stewart, who administers the gift card program. While West Virginia State Park gift cards may be used on lodging and cabin rentals, dining, gift shops and other activities at any time at all parks and forests, “Something Extra” coupons have expiration dates. The “Something Extra” coupons include a variety of goods and services offered at state parks and forests. Free admission to the Blennerhassett Museum of Regional History. Redeemable anytime in 2018. One two-hour sledding session at the Blackwater Falls State ParkSled Run, the longest east of the Mississippi. Redeemable January through March 2018, weather permitting, when sled run is open. Best Tee in West Virginia. Waiver of the 18-hole green fee at Cacapon, Pipestem, Twin Falls and Canaan Valley state park golf courses with rental of motorized cart. Redeemable at Cacapon, Pipestem and Twin Falls Sundays through Thursdays from Jan. 1 to Dec. 22, 2018, and at Canaan Valley Monday through Thursday, until Sept. 30, 2018. Super 55 Special. Special rate of $55 on a standard-type lodge room at Blackwater Falls, Cacapon, Chief Logan, North Bend, Pipestem Resort, Twin Falls or Tygart Lake. Redeemable Sunday through Thursday, from Jan. 1 – Dec. 22, 2018. Fourth Cabin Night Free. Receive a free fourth night in a cabin when you reserve and pay for three nights. Redeemable at Beech Fork, Cacapon, Twin Falls or Tygart Lake state parks. Tram Ride. Free tram ride at Hawks Nest or Pipestem Resort state parks during open hours in 2018. Campfire. Receive a free bundle of firewood in 2018 when you pay for a campsite rental of two nights. Redeemable Sunday through Thursday at campgrounds at various parks. Surprise Souvenir. Receive a mystery gift when a Somethings Extra card is completed and mailed in. 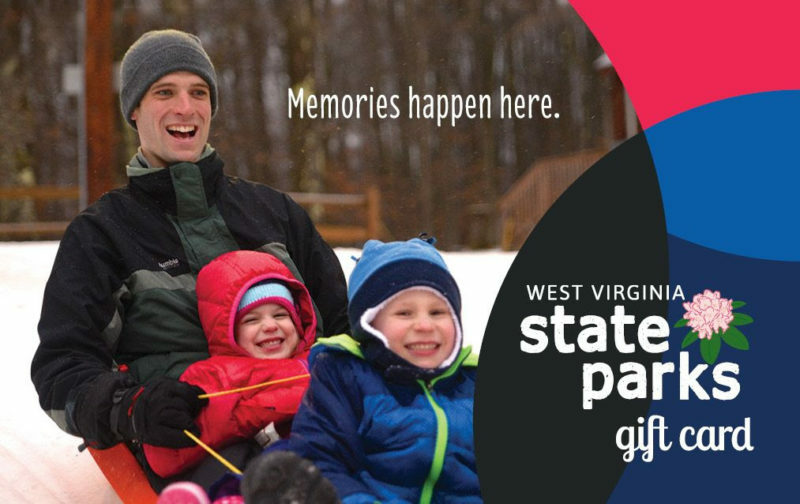 Purchase state park gift cards at www.wvstateparks.com by clicking Gift Cards at the bottom of the webpage.